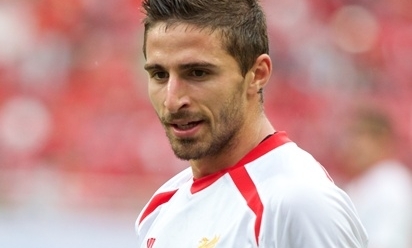 Brendan Rodgers expects Fabio Borini's season-long stay with Sunderland to not only benefit the player's development but ensure that Liverpool receive an improved asset when he returns. The Italian forward completed a temporary loan switch to the Stadium of Light last September, with the Reds boss keen for his first signing to gain further experience of the Barclays Premier League. He has thrived ever since, notching half-a-dozen goals for the Black Cats, including high-profile conversions against Chelsea, Manchester City and Manchester United. Borini is ineligible to feature in opposition to his parent club when Sunderland journey to Anfield on Wednesday night, but the 22-year-old was nevertheless under discussion at Rodgers' pre-match press conference. "Fabio went out to get games, go on loan and play more regularly than he was playing here," the Northern Irishman explained to reporters gathered at Melwood. Reflecting on the original reasons for allowing the No.29 to spend a campaign away from Liverpool with the aim of benefiting along the line, Rodgers cited the move as 'important'. The boss continued: "I just felt at the time that he needed to play. I felt it was important for him to go and get games, and get games regularly.